"It is a pity there is so little known about Ballymote Abbey.Though destroyed about 1587, the Friars must have continued to teach school there, as two students taught at Ballymote were enrolled at Salamanca about 1691". This is an extract from a letter written by T.H. Canon Quin, Parish Priest of Ballymote 1921-1943, on 24th September 1929, to a friar at the Franciscan House, Killiney, Co.Dublin. Histories of Sligo, published by this time, do not include any of the Abbey's story. J.C. McDonagh's History of Ballymote and Surroundings had not yet been published. He devotes some pages to piests, monks, and friars in the parish but he doesn't relate any of their activities to the story of the Abbey. The Friary was founded in Ballymote in 1442 by three brothers; Patrick, Andrew and PhilipO'Coleman (O Colmain), of the Third Order of St. Francis. The tradition is that Pope Eugenius IV granted permission for the founding. The bust with papal tiara on the stone over the western entrance is regarded as acknowledging his association with the coming of the Franciscans to Ballymote. McDonagh, Chieftain of Corran, the barony in which Ballymote is situated, gave the Franciscans his patronage. He occupied the Norman-built castle near the sitee. Ballymote Castle changed ownership many times during its lifetime, depending on the fluctuating fortunes of the various factions that sought its shelter. I had passed the Abbey many times down the years and saw only smothering ivy, scattered stones and headstones in weedy surroundings, all adding their share of age and neglect to the overall scene. At a more recent time a list of the guardians of the Friary in the 17th and 18th Century came my way and this caused me to think of what went on inside the walls when the ruin was a roofed and windowed Friary sheltering a community of friars inspired in their vocations by the rule of St. Francis of Assisi. I am indebted to Fr. Ignatius Hennessy at Killiney for his help in tracing some history of the Ballymote Franciscans. He gave me a list of the guardians and a copy of Canon Quinn's letter. The information in available records tells of a community subjected to all the abuses that those who promote the Reformation and enforced the Penal Laws could heap on it. Sometimes local greed and rivalries brought trials their way. But when they were ruined or destroyed, as records tell, they held on or came back to repair and continue in their mission. There were gardens and orchards round their home and one and a half quarters of land, suggesting long periods of peaceful rural pursuits. It was then Ceathramha na Sagart, a name which was a recognition of the Franciscans long service there. Today it is the townland of Stoneparks. In Medieval Religious Houses in Ireland, compiled by Aubery Gwynn and R. Neville Haddock, a paragraph on Ballymote Friary relates, "In 1483 Donald Oduda, master of the Franciscan House of Balemouta complained that Donatus MacDonkayd, a layman with accomplices attacked and burned the Friary and town driving the friars into exile and plundering them of their goods". There is no reason given for this pillage and arson, which took place forty-one years after the Franciscans came to Ballymote. McDonagh,Chieftain of Corran already mentioned(or his successor) had angered some local chieftains because of his aggressive efforts to lord it over them, and over his kinsmen, the McDonaghs of Tirerrill. Retaliation could have brought this fate on his town. This cannot be quoted as a historical fact. It might have been the plunder mentioned in Oduda's complaint,that drew the attack on the town and Friary. That the Friars returned and put their house in order again is clear by the next event when the Friary is desecrated once more.The information is also from the source quoted above, 'An Inquisition of 1584-6 found that the Friary near the castle to which it belonged had been totally ruined by rebels'.The castle had been taken over by Sir Richard Bingham, English Governor of Connacht, and he placed his brother, George as constable over it.This Bingham made enemies of the O'Rorkes of Breffni( see O'Rorke's History of Sligo Pt.II). According to Rev.Patk. Conlon,O.F.M., a Franciscan historian, the Friars had already fled to the safety of Court Abbey, a Franciscan house in the adjacent barony of Leyny. Brian Og O'Rorke proceeded to Ballymote, and it seems the Friary was his main target, to deprive Bingham of any advantage it might be to him.Medieval Religious Houses quoted above states as mentioned earlier, that the Friary at the time had "gardens, orchards, buildings, and one and a half quarter of land." One assumes O'Rorke saw a tactical advantage in destroying it. It is into the last quarter of the seventeenth century and the Franciscans are back. They are celebrating Mass in thr Friary. Their library is well stocked with books. Maybr the peace they deserve has come to them for surely it must have been a trojan effort to build up and replace what they had lost. The following extract is from Irish Priests in Penal Times (Burke W.R.) It tells a different story. "Council to Chas. Collis at Sligo 24th May 1680. We find that you have lately seized on two Friars in the Convent of Ballymote, and secured a greate library, and the Friars vestments in the said Convent and as we have given orders for the payment of the reward for apprehending the regular Popish Clergie, soe wee require that you take special care that the library and vestments be secured, and that you continue the Friars in custody." The date is 1731. "Report on the State of Popery"
Emlafada Thady Davey 1,Built about six years ago 1 These fryars live dispersed but are related to the best Popish Familys in the barony. Note. "The Fryars in Emlafada: Fra.Cormack, Guardian; Fra.Brett, Fra.Cunane,Fra. King, Hugh McDonagh, Mick McDonagh, Fra.Davey. In the column for Mass Houses, this entry, "One built about six years ago" is interesting. This church was built in a corner of the grounds beside the Friary. It establishes an important point that if the Friary was occupied in 1725, there would not have been another Church built beside it. The Friars were dispersed according to the Report. This new church, the Mass House, was the parish Church over which Thady Davey,(see Ballymote Parish Clergy), a secular priest, presided. He is not to be confused with Fra. Davey, a dispersed Franciscan. It was the parish Church until the present church of the Immaculate Conception was opened on 4th September 1864. It became the town school then, It is now the Loftus Memorial Hall in memory of Canon T. Loftus, Parish Priest of Ballymote 1894-1908, who provided funds for its reconstruction. The stones which built the Franciscan Friary in 1442 were used to build the "Mass House". Some marked the graves of the poor and the famine victims of the parish. An examination into the State of the Poorer Classes sitting at Ballymote in 1837 began its report with: "In this parish, there are of resident beggars one hundred heads of families". Desmond Bowen in his well researched work, Proslytism,Myth or Reality, refers to 600 starving labourers seeking help at Ballymote. The burial ground passed to the control of the Ballymote Dispensary Committee formed in 1853, and they used stones taken from the ruins to build the wall around it. What is left is today's ruin. 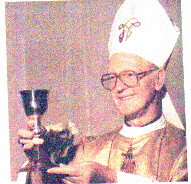 Most Rev Dr Thomas Flynn,Bishop of Achonry, holding the Chalice used by Franciscans Friars in Ballymote at the 550th anniversary of the foundation of the Franciscan Friary in Ballymote in 1992. The Anton McDonagh chalice is the only memorial left today, whose association with the Franciscan Friary at Ballymote is stamped on it.The inscription on the base of the Chalice in abbreviated Latin translates, "For the Convent of the Friars Minor of Ballymote:Friar Anton McDonagh had it made: September 1688". This precious vessel was in Ballymote for the celebration of the 550th anniversary of the coming of the Franciscans. Friar Anton McDonagh was a guardian of the Friary. There was a succession of guardians from about 1640 to 1840. A guardian would serve for one year but could serve for a longer period. Guardians were still appointed when the title was titular only- always with the hope of returning. The implication in the Popery report is that those friars who did not take the Oath of Abjuration, or provide acceptable sureties for their behaviour were being sheltered by the best Popish families in the barony. This was true but they were keeping ahead of the priest-hunters, and might often have to change abode. One thing is certain, the Franciscans did not return to Ceathramha na Sagart. In the townland of Kilcreevin is Scealp an Aifrinn. It is sheltered by a low cliff or bank ,rising to higher ground.Here some hunted priest gathered hif flock to celebrate Mass. There was a watch kept because he risked the same fate as his confreres in 1680 in the Friary.The Anton McDonagh chalice could have been raised at the Elevation here.